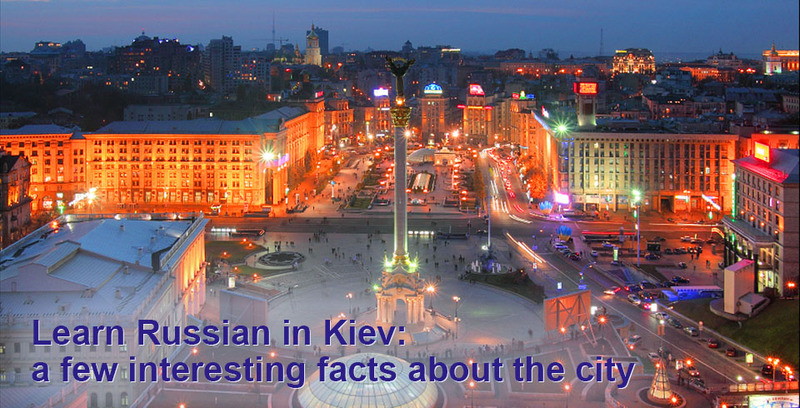 Learn Russian in Kiev: a few interesting facts about the city . The Ukrainian capital is the third largest Russian-speaking city. Therefore, a lot of people travel to Kiev to learn Russian. If you are thinking of going to learn Russian in Kiev, you should read our collection of interesting facts about the city. Not every citizen of Kiev knows all these facts. The green area in Kiev is 56 thousand hectares. If we divide all green area between the inhabitants of the city, it will make about 20 square meters per every person. “I’ve been to lots of different cities, big and small. I’ve seen beautiful parks there, but it’s the first time in my life I’ve seen the city in a park”. A chestnut is the most popular tree in Kiev. First, chestnuts were planted only along one highway, but later, they spread around the city. The oldest tree is Wilhelm Krister oak which is estimated to be 600-700 years old. Khreshchatyk is the main street of the Ukrainian capital. It keeps two records: it is the shortest among the main streets in the European capital cities (1,300m), although it is also the widest main street (75 m). Three times the street became a ground for mass protests: in 2000, 2004 and 2013. The last actions of protest led to the change of power in Ukraine and resulted in political instability in Europe. The street was keyed, and the protesters’ tent camp was located there. The major clashes with the police in which lots of people were injured also happened there. Khreshchatyk is one of the most popular tourist places in Kiev. At weekends and during the city festivals the street is closed for transport. Open-air concerts regularly take place there, street musicians and artists perform there, too. A monumental statue installed in Kiev on May 9, 1981. It is 102 m high, and it weighs more than 500 tons. It is one of the largest statues in the world. It is located on the territory of “The Museum of the History of Ukraine in World War II”. The statue stands upon the museum building where there is an exposition devoted to World War II. The museum itself is one of the largest in Ukraine; it holds more than 300 thousand exhibits. The most valuable ones are “The Unread Letters of 1941”. This is a collection of 1,186 unopened and unread letters that were taken by the German troops in 1941. In 2010 the lettered were given to the museum. Today about 500 letters have been sent to the addressees or their relatives. It was common to decorate the metro stations in the Soviet Union. In 1989 in Kiev the station “Golden gate” was opened. It is considered one of the most beautiful metro stations in the world. It is decorated with mosaics which depict the Dukes of Kiev Rus and churches of Kiev. If you go from the beginning of the station until its end, you can see the depictions of all Kiev governors from the 11th to 13th centuries. There is one more metro station that is worth seeing – “Arsenal”. It is different from other metro stations because of its depth. It is the deepest metro station in the world – 105.5 meters. Besides that, it also has a few interesting architectural elements in its design. A lot of people know the name of Igor Sikorsky , Russian and American aircraft designer. Sikorsky was born in Kiev. In Kiev he did his first attempts to design aircrafts. In the autumn of 1909 at the air show he demonstrated his first helicopter. The experience was not a success: the helicopter wasn’t able to take off with a pilot. Then Sikorsky started to design airplanes and he achieved certain success in this field. Later, the inventor came back to designing helicopters which his name has been associated with. in 1941 a German engineer Konrad Zuse succeeded in inventing Z3 – a programme -controlled machine which is considered the first computer in the world. At the end of the 1940s in Kiev there was invented a small electronic accounting machine that is considered the second programmed computer and first fully electronic accounting machine in continental Europe. Kiev is an incredibly beautiful and diverse city where ancient cathedrals are found side by side with modern technologies. People in Russia, Ukraine and Belarus consider Kiev Rus as their historic ancestor. The history of Russian statehood started there. Nowadays the capital of independent Ukraine is one of the largest European cities that is actively developing does not forget about its history.